Gedrosia ( ; ) is the ancient name of an area that corresponds to today's Balochistan. Eastern Balochistan is southwestern province of Pakistan and parts of southwestern and south-central Afghanistan and western Balochistan is divided between Iranian provinces of Hormozgan and Sistan va Baluchestan. The area which is named Gedorsia, in books about Alexander the Great and his successors, runs from the Indus River to the southern edge of the Strait of Hormuz . It is directly to the south of the ancient provinces of Arachosia and Drangiana, to the east of Carmania and due west of the Kingdoms of Ancient India. 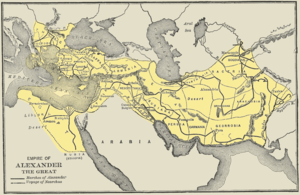 In 325 BC, Alexander the Great crossed the area on his way back to Babylon after campaigning in the east. Historians say he lost three-quarters of his army to the harsh desert conditions along the way. John Prevas, in his book "Envy of the Gods: Alexander the Great's Ill-Fated Journey Across Asia", says that Alexander wanted to punish his army for refusing to conquer more of India.